Don’t call Nancy Grace a hero. (Seriously, don’t.) Yes, she has the ability to resolve any crisis, whether it be political, cultural, or the disappearance of an attractive white lady, by yelling at it. But she puts on her pantsuit one leg at a time, just like the rest of us. Grace’s latest achievement is ending the debate about marijuana legalization, which she accomplished last night on her HLN show. 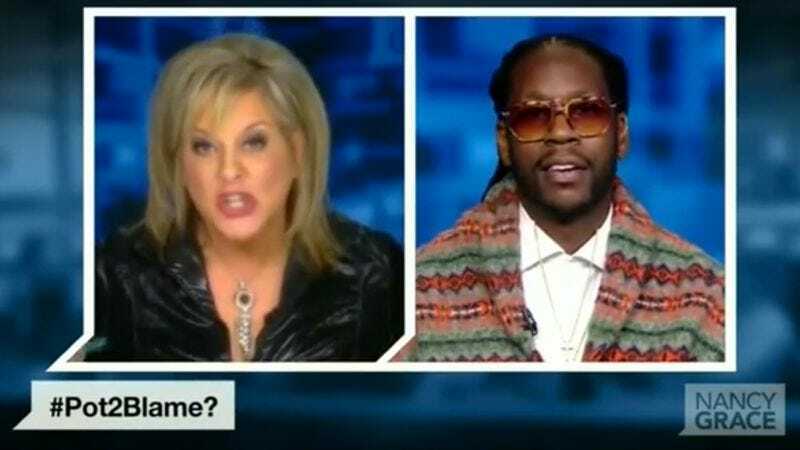 She did so by showing the rapper 2 Chainz a handful of videos where idiots videotaped themselves giving their preschool-aged children pot, presumably because getting the dog high wasn’t funny anymore. See? Drug war won. More video of the debate, the maximum enjoyment of which probably has #Pot2Blame?, is below.